The Pine Ridge Indian reservation, established in 1890, is located in southwestern South Dakota. In the 1930s the Work Progress Association (WPA) setup a boarding school on the reservations, the goal being to remove children from their homes and place them in school where they spoke only English. There is no tradition of pottery amongst the Lakota Sioux Indians of the Great Plains – the Sioux were a nomadic group that followed the bison herds and as such were light travelers. The Sioux are reported to more frequently have used baskets than pottery, baskets being far lighter to transport. The pottery that they did travel with was not decorative, but rather very functional. Thus Pine Ridge Pottery might be considered a white man’s medium decorated by Native Americans. The WPA project brought white instructors to the boarding school, to provide pottery for home use and to help the Indians sustain themselves as craftspeople. Bruce Doyle was hired in 1937 to run the ceramics program in the high school. Doyle, a North Dakota native, had studied in North Dakota, probably at UND, where he connected with Margaret Cable. In addition Peter Flaherty told us that Doyle had studied at UCLA, the University of Washington, the University of Oregon and the UW-Milwaukee. In his 1988 book “Art Pottery of the Midwest”, Marion Nelson reported that Doyle’s son said his father studied pottery in Madison, Wisconsin. Doyle is credited with making molds at the Pine Ridge Reservation and with formulating glazes suitable to local clays. Perhaps coincidental to Doyle’s arrival, in 1937 Margaret Cable, director of ceramics at the University of North Dakota, was hired for six months by the U.S. Field Services as a Traveling Education Specialist in Ceramics. Much of her time seems to have been spent at the Pine Ridge Reservation teaching a course designed for ceramics instructors – the course was usable for credit at UND and USD. In addition to teachers, community members were also welcome to attend this class. The years 1937-1940 are considered to have been the most productive at the Pine Ridge high school pottery. Doyle built two large kilns and taught both molding and throwing. Pottery supported the other craft programs during this period, earning $40,000 for the school. Doyle left in 1940 to take a promotion to principal in Allen, S.D., but his trainees maintained the pottery program for quite some time after his departure. However, sometime during the 1940s the production of Pine Ridge pottery at the high school ended. Among those trained by Doyle were three sisters of Sioux origin who are credited with continuing the Pine Ridge pottery after the high school program ended. Ella Irving (known as Ella Woody during the late ’30s and Ella Cox during the 1940s) secured a loan to purchase a log building in downtown Pine Ridge to continue pottery production. Clay was dug near this area and glazes were produced locally, as at the school. Ella and company continued using the incised mark “Pine Ridge Sioux” sometimes including the word “Indian”, under a pine tree on a ridge. Ella and her sister Olive (also known as “Ollie”) Cottier threw pots on the wheel, while the third sister, Bernice Talbot did the work of casting, glazing and decorating the pottery. Pine Ridge produced a good variety of ware, much having geometric cream-colored slip decoration executed in sgraffito (glaze applied then scratched away in decorative patterns, revealing the clay underneath). 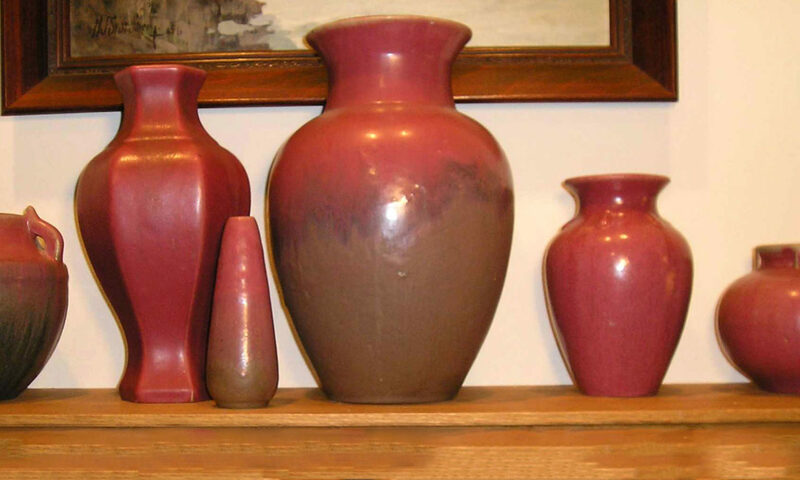 The clay was often red and covered with a clear glaze. Plain glazes of several colors were featured as well. Peter Flaherty commented that the pieces with a milky top glaze are particularly beautiful. There appears to be some debate about the precise timing of events surrounding pottery production at the Pine Ridge high school. Peter’s notes tell that the Irving sisters took over at the high school, but quit in 1943 when Bill Artis was hired as the new director of Pine Ridge pottery. In addition, Peter’s information notes that it was 1955 when Ella Irving secured a loan and bought the pottery from the Pine Ridge boarding school. The demise of Ella’s efforts appears to have come in the 1980’s when her shop was vandalized and equipment was stolen. Production ceased at this time, despite continuing demand for the pottery. In Sept. of 1999, at the age of 93, Ella Irving was awarded the 10th annual South Dakota Living Indian Treasure Award in recognition of her contributions to Native American art forms. Her pottery can be found around the world, including in the Smithsonian Institute. Clay for Pine Ridge pottery included red clay from the Pine Ridge reservation and a white clay from the Black Hills. Some additional marks on the pottery included Ella Irving’s pieces marked “Woody” (her married name) and “E. Cox” (from her second marriage). Pieces from 1930something until 1942 were marked “Oglala Lakota Sioux”, signed by Bruce Doyle. “Ramona Wounded Knee” was the signature used by Olive Cottier. “OCHS” marking signifies Oglala Community High School, the name of the boarding school. And from 1930something until about 1941 pieces were signed by “Nora Fire Thunder”. Dommel, Darlene. (1996) Dakota Potteries. Nelson, Marion. (1988) Art Pottery of the Midwest.